The pure form of antimony is used to make certain types of semiconductor devices, such as diodes and infra-red detectors. An alloy of lead and antimony is used in batteries, low friction metals, small arms and tracer bullets, cable sheathing as well as other products. 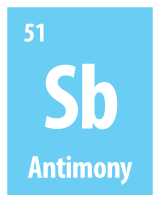 Other compounds of antimony are also used to make paints, glass, pottery and ceramics. A significant new use for antimony is the development of a new generation of memory devices which will replace the flash drive memory devices presently used in computers, mobile phones and USB memory devices. Demand for antimony is increasing. Excellent opportunities exist in NSW for the discovery of major new deposits and for the development of existing resources. Read about Antimony [2.27 MB] mineralogy and prospectivity in NSW. The New England district in NSW has been identified as areas of significant antimony deposits and awaits further exploration and development. The Halls Creek area near Armidale in the New England district is being actively explored by Precious Metal Resources Limited for base metals and has made promising discoveries with potential of high grade, multi-metal field with world-class potential. Antimony is considered to be a secondary target to gold. The Bielsdown project, owned by Anchor Resources Limited, is located 12 km north of Dorrigo in the New England district. The project includes the Wild Cattle Creek antimony mine, which was discovered in the late 1800s and mined intermittently on a small scale until the most recent mining in the 1970s. The area is still prospective. The Clarks Gully Project, owned by Hillgrove Mines Pty Ltd, is located near the Hillgrove Mine near Armidale in the New England region of NSW. The company has proposed to recommence mining for gold/antimony at the former Clarks Gully mine by way of a small open-cut pit followed by an underground mine. Hillgrove Mines Pty Ltd is the operator of mining leases for the Hillgrove mine. The Hillgrove Mine is a world-class producer of gold and antimony. Bracken Resources (the parent company of Hillgrove Mines Pty Ltd) has stated it is primarily interested in it as a gold mine. However, the value of antimony mining to the operation has not been overlooked. Exploration drilling has determined a proven resource of more than six million tonnes at the Hillgrove Project and the company is confident further drilling will substantially increase their known reserves and resources of both gold and antimony. The antimony deposit is the largest in the world outside of China.